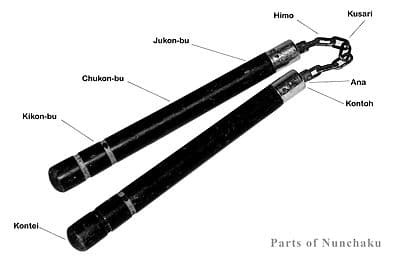 The nunchaku (Japanese: ヌンチャク Hepburn: nunchaku, often “nunchuks“, “chainsticks“, “chuka sticks“ or “karate sticks“ in English) is a traditional Okinawan martial arts weapon consisting of two sticks connected at one end by a short chain or rope. The two sections of the weapon are commonly made out of wood, while the link is a cord or a metal chain. The nunchaku is most widely used in martial arts such as Okinawan kobudō and karate, and is used as a training weapon, since it allows the development of quicker hand movements and improves posture. 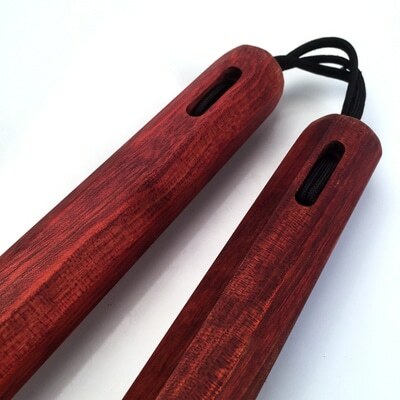 Modern-day nunchaku can be made from metal, wood, plastic or fibreglass. Toy and replica versions made of polystyrene foam or plastic are also available. Possession of this weapon is illegal in some countries, except for use in professional martial art schools. The exact origin of nunchaku is unclear. Allegedly adapted by Okinawan farmers from a non-weapon item, it was not a historically popular weapon because it was ineffective against the most widely used weapons of that time, and few historical techniques for its use still survive. 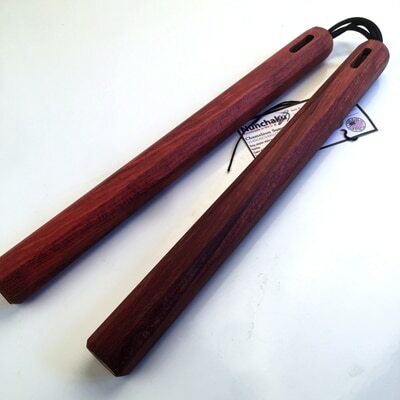 In modern times, nunchaku (Tabak-Toyok) were popularized by actor and martial artist Bruce Lee and his martial arts student Dan Inosanto, who introduced this weapon to the actor. Another popular association in modern times is the fictional character Michelangelo of the Teenage Mutant Ninja Turtles franchise. 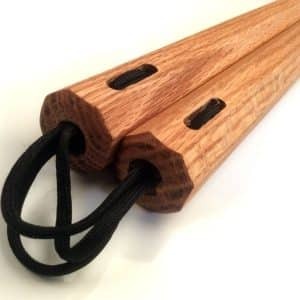 Organizations including the North American Nunchaku Association, World Amateur Nunchaku Organization, Fédération Internationale de Nunchaku de Combat et Artistique, World Nunchaku Association, and International Techdo Nunchaku Association teach the use of nunchaku as a contact sport. The origin of the word nunchaku (ヌンチャク) is not known. One theory indicates it was derived from pronunciation of the Chinese characters 双截棍 (a type of traditional Chinese two section staff) in a Southern Fujian dialect of Chinese language (兩節棍 nng-chat-kun, pair(of)-linked-sticks). Another derives from the definition of “nun” as “twin”. Another name for this weapon is “nûchiku”(ヌウチク). 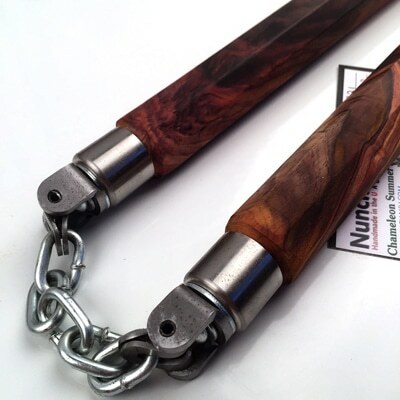 In the English language, nunchaku are often referred to as “nunchuks”. 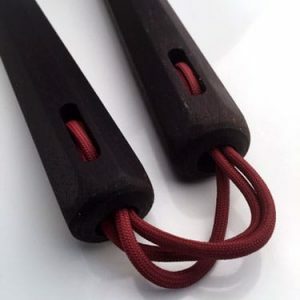 The origin of the nunchaku is unclear, although one popular belief is that nunchaku was originally a short South-East Asian flail used to thresh rice or soybeans. This gave rise to the theory that it was originally developed from an Okinawan horse bit (muge), or that it was adapted from a wooden clapper called hyoshiki carried by the village night watch, made of two blocks of wood joined by a cord. The night watch would hit the blocks of wood together to attract people’s attention, then warn them about fires and other dangers. Some propose that the association of nunchaku and other Okinawan weapons with rebellious peasants is most likely a romantic exaggeration. Martial arts in Okinawa were practiced exclusively by aristocracy (kazoku) and “serving nobles” (shizoku), but were prohibited among commoners (heimin). According to Chinese folklore, nunchaku are a variation of the two section staff. Since the 1980s, there have been various international sporting associations that organize the use of nunchaku as a contact sport. Current associations usually hold “semi-contact” fights, where severe strikes are prohibited, as opposed to “contact” fights. “Full-Nunch” matches, on the other hand, are limitation-free on the severity of strikes and knockout is permissible. World Safety Nunchaku Organization (WSNO) : Safety Nunchaku Grandmaster Soshihan S. Kothandan, India’s Senior most Shito-ryu Karate exponent who got trained under many world level renowned Grand masters in Martial Arts, has gained rich technical expertise in that domain by his passion towards the Art, and he has achieved many milestones in Karate field particularly in Shito-ryu Karate from the past 46 years. He started researching in Safety Nunchaku from 1991 onward. He founded and presented Safety Nunchaku for the first time in front of the general public and Honorable Ministers of Tamil Nadu, India on 28.08.2005. On this day, Safety Nunchaku, Kata, Team Kata, Kumite, Team Kumite, Own style, Stand Target, Moving Target and other new techniques were demonstrated. This research is being continued by means of meeting experts from different parts of the world and sharing their view on Safety Nunchaku as a game and as a Martial art. Finally, 02-08-2015 he had introduced Safety Nunchaku in front of VIP’s, and General Public & released website (www.worldsafetynunchaku.org), demonstrated KATA’s and gave Black Belt to 1st Batch who got training more than two years during his research period. 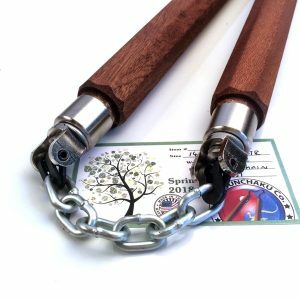 With his vast knowledge, experience and hard work he has introduced and dedicated first time in the Martial Art field “World Standard 16 unique Katas” in the field of Safety Nunchaku. If a person know the proper names of the techniques, correct method of practicing such techniques and most important is where to apply such techniques and what circumstance to apply those techniques then he will do very well in real life under critical situations where his safety is prime concern. 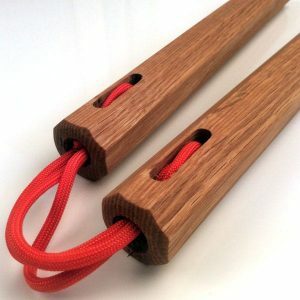 By keeping those very important facts in mind, he has framed Katas in Safety Nunchaku in a simple and elegant way where a common people can get into interest to practice and understand the nuances of each techniques.He has also followed some unique methodology to name “World Standard 16 Unique KATAs” in Safety Nunchaku. In general Japanese, when they design a Kata, they gave their names or their master names. But, In Safety Nunchaku, Grandmaster Soshihan S.Kothandan had given names Single chaku “World Standard 16 Unique Katas ” to the patriots-freedom fighters, who made the country to proud globally, People who made proud India in Martial Arts and aid citizens to spread the Art throughout the country and People who supported, encouraged Soshihan in the Karate domain and considered his growth and success as a growth of Martial Art. Safety Nunchaku Grandmaster Soshihan S. Kothandan to insist that fact to future generation to remember those legends in the Name of KATA in near future. Also he categorized the above Unique katas as Origin Katas (4), Fundamental Katas (4) & Superior Katas (8). He also manufactured with foam and foam rubber Safety Nunchaku cheaper, different colors and different sizes to use all ages of public. World Nunchaku Association (WNA): Founded by Milco Lambrecht in the Netherlands in 1996. WNA uses yellow and black plastic weight-balanced training nunchaku and protective headgear. They have their own belt color system, in which participants earn color stripes on the belt, instead of fully colored belts. One side of the belt is yellow and the other black, so that in a competition, opponents may be distinguished by the visible side of the belt. WNA fight rules correspond to the kumite subsection of Nunchaku do discipline. It is a two-minutes “touch fight,” in which technical abilities are very important. After each scored point, the fight stops and the fighters take back their starting position.